At the German Grand Prix yesterday, McLaren pulled off the fastest pit stop in competition history, swapping the four tires on Jenson Button's car in just 2.31 seconds. Button didn't lose a single place on the grid. 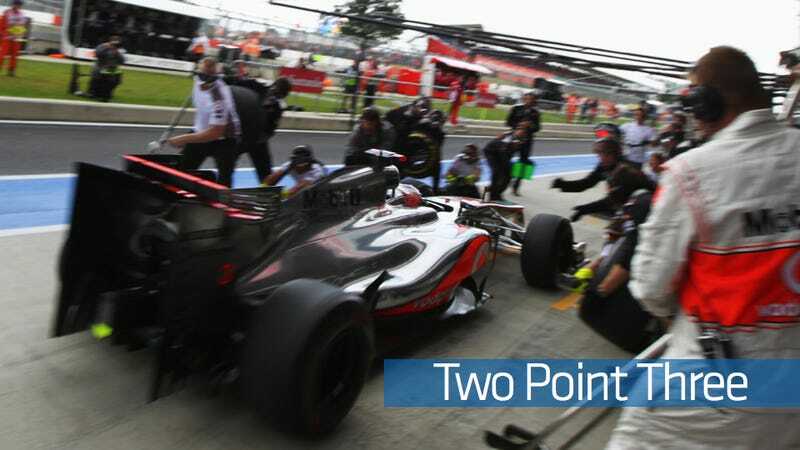 To put the stop (measured when the car is at a complete standstill) in context, most of the pit stops in the German Grand Prix were over a second slower than McLaren's fastest, and most four-tire-changing stops in Nascar are around ten seconds slower. Moreover, this unofficial record-breaker was many times better than McLaren's disastrous stops earlier this season. All the team really cared about was that this pit stop allowed Button to move up from third place to second when Vettel pitted shortly after him.